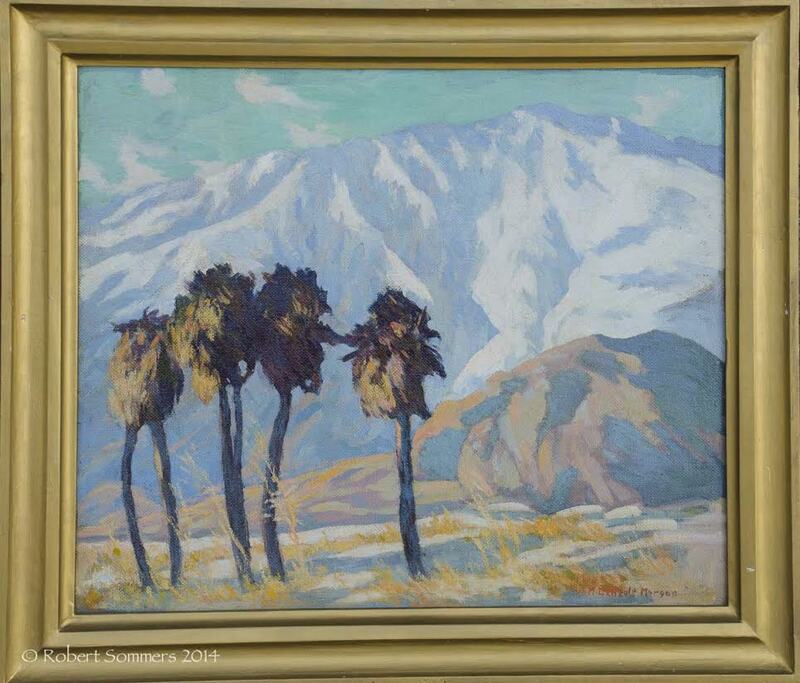 Mary DeNeale Morgan (1868-1948) California Desert o/b 24 x 30″, signed lower right, signed and titled verso WPA p.o.r. Mary DeNeale Morgan was known for her pastel paintings and etching and as a longtime California artist, left a great legacy as a teacher and organizer as well as painter. In addition to pastel, she worked in tempera, oil, and watercolor, and painted sand dunes, adobes, landscapes, and the wind-swept cypresses of the Monterey Peninsula. She was born in San Francisco, California on May 24, 1868, and as a child of two years, moved to Oakland where her father, Thomas Morgan, was the city engineer. She was a favorite pupil of William Keith from her youth until the time of his death. Morgan also studied at the School of Design under Virgil Williams, Soren Carlsen, Amedee Joullin and Arthur Mathews. In 1896, she opened a studio in Oakland and, for a brief time, taught art at Oakland High School. In 1910, she settled in Carmel, where she had had a studio from 1904, and from Sydney Yard, she bought his studio home located on Lincoln near Seventh Street. In Carmel, she became a vital part of the art community. She was a pupil in William Merritt Chase’s summer classes there in 1914, and from 1917 to 1925 was director of the Carmel School of Art. She was also a founder of the Carmel Art Association. Living for many years on this Monterey peninsula, she was a prolific painter in watercolor, oil and pastels of the region’s geography and historic architecture. Among her paintings were scenes with cypress trees, sand dunes, adobe structures and ocean views. Exhibition venues included the San Francisco Art Association, California State Fair, Del Monte Art Gallery, California Watercolor Society and Carmel Art Association. Among her affiliations were National Association of Women Painters & Sculptors, San Francisco Art Association, California Watercolor Society, Laguna Beach Art Association, American Federation of Artists, and Carmel Art Association. In addition to numerous museums, her works are in the collection of Union High School at Monterey, Monterey City Hall and Presidio, Sunset School at Carmel, Salinas High School, Harrison Library at Carmel and Society of California Pioneers. In 1928, the editors of Scribner’s magazine named her as one of the nation’s foremost women artists. During World War II, she made weekly visits to nearby Fort Ord to sketch the servicemen. Unmarried, Morgan died in Carmel on October 10, 1948.